The 2-in-1 cargo trailer, featuring a robust one-wheel structure, is perfect for carrying goods with ease. Our 2-in-1 cargo trailer, apart from serving as a cart, is also easily attached to any bicycle. It is suitable for all bikes with quick release rear wheels. This 2-in-1 cargo trailer, with a maximum load of 88 pounds, is designed with a rigid construction, which will surely offer you long years of use. The storage bag is made of 600 D Oxford cloth to protect your cargo perfectly. This 2-in-1 cargo trailer is easy to assemble. 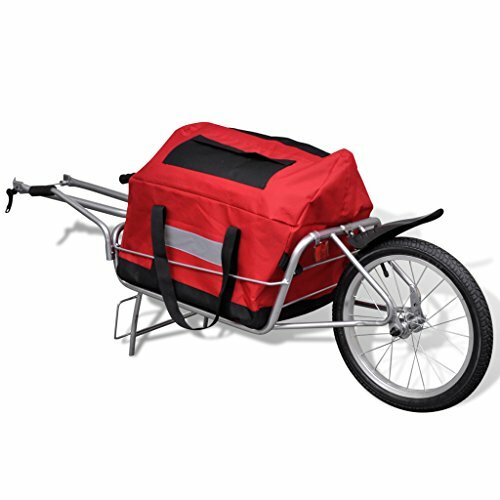 Our 2-in-1 cargo trailer, apart from serving as a cart, is also easily attached to any bicycle. This 2-in-1 cargo trailer, with a maximum load of 88 pounds, is designed with a rigid construction, which will surely offer you long years of use. The storage bag is made of 600 D Oxford cloth to protect your cargo perfectly.